Nancy Hughes of Stove Team International has provided a report from tests on their Ecocina stove conducted at Aprovecho Research Center. 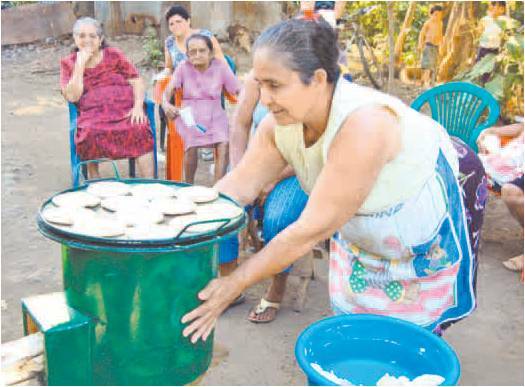 the stoves was introduced in El Salvador in 2007 and has been well received. See test report and new article attached. The Ecocina Stove, developed by Larry Winiarski and Nancy Hughes, was received at the Aprovecho laboratory in March of 2008. Aprovecho conducted standard laboratory testing to determine the performance of the stove in relation to the benchmarks for improved stoves. The safety of the stove was also evaluated. The stove performed extremely well for heat transfer and combustion efficiency, and the design is quite safe. A benchmark certification document is provided at the end of this report. The Ecocina Stove consists of a baldosa combustion chamber surrounded by a wide sheet metal body. A grate/fuel shelf made of re-bar is also included. The stove is supplied with and was tested with an adjustable skirt. The tested stove was a prototype of the final model. The stove was tested under the Aprovecho portable emissions collection hood, in which real-time emissions of CO2, CO and PMTSP were recorded. The system also measured the flow rate of the diluted exhaust gases, enabling mass-based calculations of the emissions produced during the test. The Ecocina was tested using a 2003 UCB Water Boiling Test (WBT). The first phase of the test consists of a high-power analysis in which 5 Liters of water are brought to a boil twice in an uncovered 7 Liter pot. First the water is boiled with the stove body starting cold, and then again with the body starting hot. In the low power phase of the test, 5 Liters of water is simmered at about 3 degrees C below full boiling temperature for 45 minutes. Standard testing wood consisting of sticks (2 cm X 2 cm by 30 cm long) of kiln-dried Douglas fir at 14.4% moisture content (on a wet basis) were used for testing. Aprovecho has been designing, testing, and helping to disseminate improved stoves for the past 20 years. Over 60 cooking stoves from around the world have been tested in the Aprovecho Laboratory in the last several years using this standard testing protocol. Based on this extensive library of tests, Aprovecho has developed suggested “benchmarks” of stove performance. These benchmarks help to define the performance of a truly “improved” cooking stove. The Ecocina stove with skirt used only 2/3rds of the fuel compared to the laboratory three-stone fire, and boiled 5 Liters of water in about the same time. 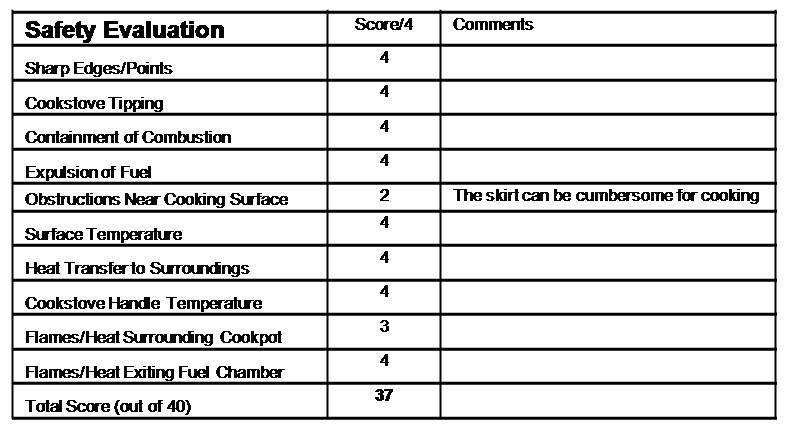 The fuel use benchmark was comfortably met when the stove was used with a skirt. There is no benchmark for time to boil. The Ecocina produced only 1/3rd of both the carbon monoxide (CO) and particulate matter (PM) emissions compared to the laboratory three-stone fire. Emissions of CO and PM were similar to other well-designed rocket stoves tested in the Aprovecho laboratory. The measures of both emissions easily met the Aprovecho benchmark of performance. The safety of the Ecocina Stove is quite good. The body is wide, making it stable and unlikely to tip. This also helps to keep the outside of the stove body cool, reducing burns. The fuel entrance tunnel is long and small, protecting the user from the fire from exiting the stove entrance. The use of a skirt generally makes the stove less safe, as the pot is surrounded by flames and hot metal. •	The heavy grate should be durable and long-lasting. •	It would be helpful to create a sloped stove top, following constant cross sectional area, to help maximize heat transfer in case the stove might be used without a skirt. A benchmark certification document can be found in the remaining pages. For further questions about this report, please contact Nordica MacCarty, Laboratory Manager, at nordica.maccarty@gmail.com.